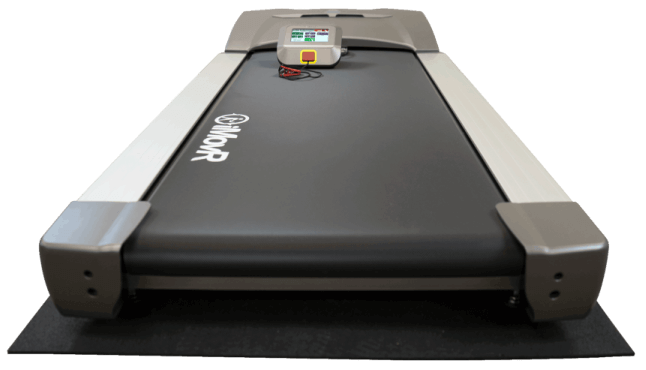 The ThermoTread GT is quieter and smaller than other office treadmills, with a footprint of just 67.5” x 28.35”. Its noise level of 42.7 dB is less than that of the HVAC system in most offices. Whether you're adding a single treadmill or outfitting the whole department, the ThermoTread is designed for minimal workplace disruption. The ThermoTread’s modern touch-screen console is light years ahead of the “membrane” consoles found in competitors’ treadmills. Its simple interface is like using a smartphone, not gym equipment. The console contains a powerful computer with a USB port to enable easy downloads of future software upgrades. The treadmill’s motor is engineered for the unique stresses of continuous walking. It doesn’t pretend to be a dual-use office/gym treadmill—our engineers know that a motor tuned specifically towards lower walking speeds will have a longer lifetime of reliable use. The ThermoTread tops out at only 2.5 mph, with an ideally geared high-torque drivetrain for office walking speeds, with a massive 3.0 horsepower, 4000 RPM DC motor at its core. We back up our components with an exceptional three year motor warranty. iMovR’s upcoming optional CloudStation will allow the ThermoTread GT to track your fitness stats, featuring a treadmill-accurate step counter, cloud data storage, and multi-device control. Once a user sets up their profile in the iMovR cloud - along with preferred treadmill speeds, desk height and monitor height - they’ll be able to log into any iMovR treadmill desk, and immediately get to work at their ideal ergonomic position, while having every step they take automatically recorded to their online profile. Coming soon. The ThermoTread GT is a NEAT™ (Non Exercise Activity Thermogenesis) certified product. Its usage will increase energy expenditure to help combat the negative health effects of a sedentary lifestyle. Treadmill desks were developed from research into prolonged sitting and the health benefits of NEAT, and they continue to lead the office fitness revolution. Once upon a time the first treadmill desk was created by marrying an adjustable-height desk to a cannibalized running treadmill base. That was more than eight years ago, yet every treadmill desk in the world since has been made using the same recipe. 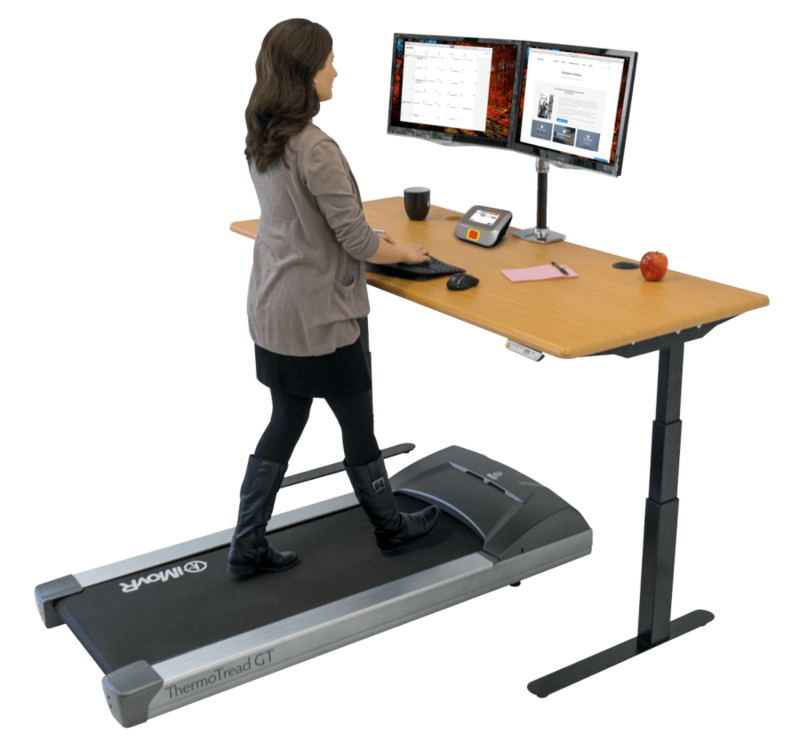 Every walking base sold as a “treadmill desk” has its roots in gym equipment, as evidenced by footprint, noise signature, console design and motor gearing ratios. iMovR is proud to introduce the ThermoTread GT – the first treadmill desk base designed from the ground up to live in an office environment, not a gym. From upgraded componentry to a sleek, touch-screen LCD desktop console, to its ability to interact with personal performance tracking and corporate wellness software in the cloud (via optional CloudStation available 2018), the ThermoTread GT represents the new standard in office fitness equipment. The ThermoTread GT Office Treadmill received a five out of five star rating from WorkWhileWalking's expert review team. Read their review here. Some 1st-generation treadmill desks are known to have shorter service lives than one would expect. Walking very slowly for long periods of time on a treadmill geared for running is likely to result in premature motor or controller board burnout. Moseying along at a pace of only 1 - 2 mph requires the treadmill’s motor to overcome the immense friction of pulling a dead weight on a rubber belt across a laminated deck. A treadmill designed for a top speed of 12 mph will only have one-sixth to one-twelfth of its rated horsepower at treadmill desk sauntering speeds, imposing a very heavy strain on the drivetrain. The ThermoTread's high-torque drivetrain (rollers, flywheel, pully, etc) is specifically formulated for walking speeds—it's engineered to last. We upgraded the deck from the cheaper melamine and phenolic materials used on competing treadmills to a superior 1”-thick Bakelite material. We added a cooling fan to keep motor temperatures under control even if the treadmill is under round-the-clock use, but we made it so silent you can’t even tell its running. Since no one will ever run or even walk briskly on a ThermoTread, we shortened the deck in order to gain back precious floor space that competing units steal away. We even lowered the treadmill deck to maximize desk stability and minimize obstruction. Two wheels positioned underneath the motor housing make it easy to slide the treadmill underneath any adjustable-height desk. The ThermoTread is quieter than the least-noisy competing treadmill base (the LifeSpan TR-1200), by a whopping 5 decibels. It’s built with more reliable componentry than any other walking base on the market. ThermoTread GT consumes half the power and is dramatically quieter than the LifeSpan TR-5000, since it doesn’t require an AC inverter and the noisy continuous fan to keep it cool. Even though it costs $500 less than the TR-5000, the ThermoTread GT looks just as nice, if not nicer, with its all-aluminum side rails. A sure telltale sign that a treadmill was designed by a gym equipment engineer is if its desktop console controls are made with a membrane keypad. 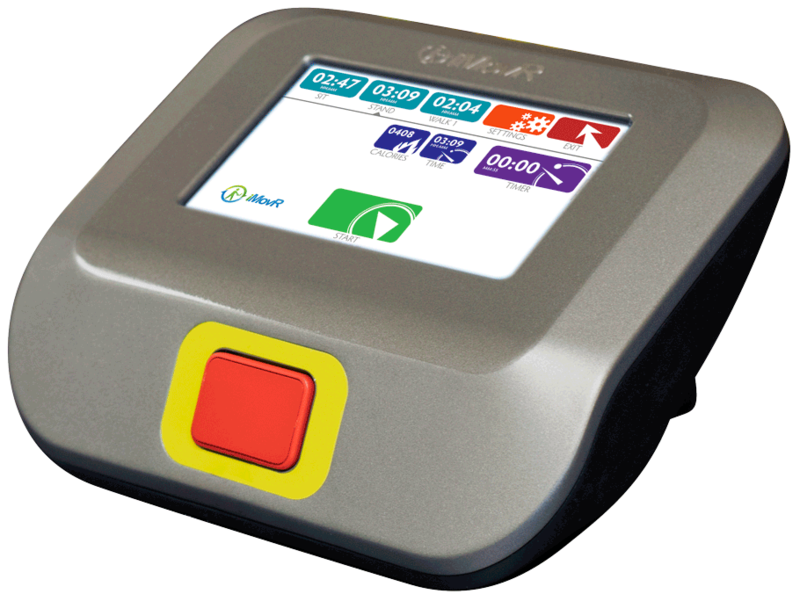 Membrane key switches stand up to cardio exercisers’ dripping sweat but they have a tendency to degrade rapidly with continuous use. The bigger downside to membrane keypads is their fixed functionality. The ThermoTread GT is the only treadmill desk base on the market that uses a touch-screen LCD, housed in a sleek desktop console that doesn’t look out of place with the laptops, tablets and mobile devices found at the modern office workstation. All the basic functionality is there today to display walking speed, distance, time, calorie burn and other performance statistics, just as you’d expect from any treadmill desk. But that’s where the commonality ends. We know that no one enjoys having to press twenty buttons to restart their treadmill just because they stepped away for ten minutes. With the smartphone-like user interface of the ThermoTread’s desktop console our engineers were able to make the displays faster to interpret and navigate, and to store and retrieve user preferences and usage info easily. Lawyers, often chained to a desk for most of their day, have generally been among the earliest adopters of treadmill desks. But ironically, in-house lawyers have often been unwilling to sanction their use within corporate confines, over concern for potential employer liability. It’s easy to understand given the thousands of treadmill injury claims that are filed each year and the many examples of reckless treadmill escapades one can find on YouTube. In designing the ThermoTread GT we consulted with lawyers, insurers, corporate customers and engineers to completely overcome this concern once and for all. First, our treadmill base is UL certified to never exceed 2.5 mph. Virtually all treadmill injuries happen at much higher speeds, either through mishap or through cardio exhaustion. No injury claim has ever been reported at this sub-walking speed limit. Second, before activating the treadmill, our console requires the user to click off on a liability waiver “click wrap,” just like they do when using the GPS navigation system in their car. This exclusive feature of iMovR treadmill desks protects your organization from unsafe operation and potential liability, while creating a contemporaneous record of all equipment usage. 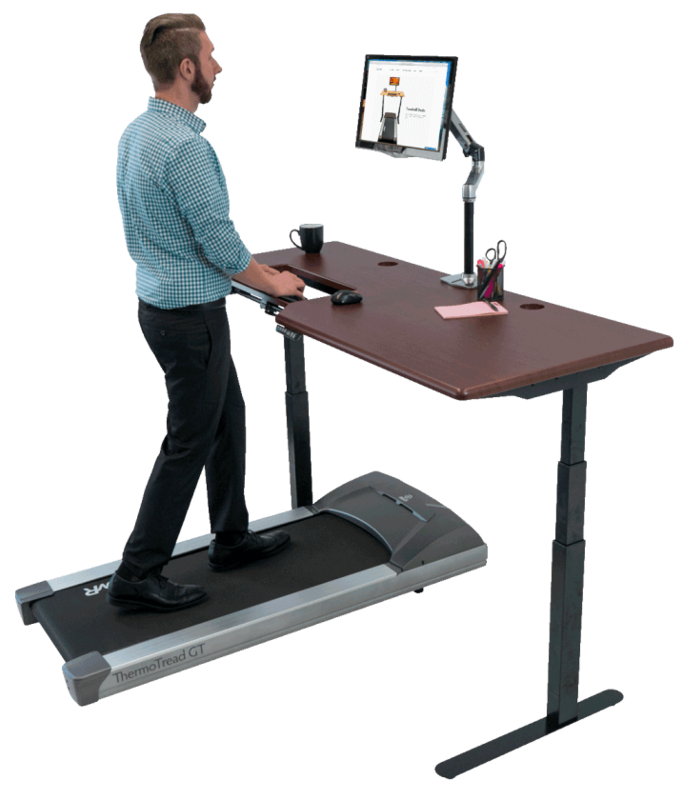 No other treadmill desk in the world has this feature, designed specifically for large enterprise organizations and public space usage. Now the lawyers can share their love for treadmill desks with everyone, without reservation. The CloudStation will come in the form of a long power bar, to be installed underneath the desk. The treadmill, electric adjustable-height desk, and all electrical devices on your desktop will be able to plug into the CloudStation, all neat and tidy. Each power plug is software controlled so you can set single-touch power conservation modes, such as turning everything off as you leave the office, except for that laptop charger you’d like to keep on. The plug for the treadmill itself is special. Our proprietary circuitry on that plug works like a cardiogram, precisely measuring the health of the treadmill and the usage profile of the user by interpreting current fluctuations generated when the user’s feet step on the belt. 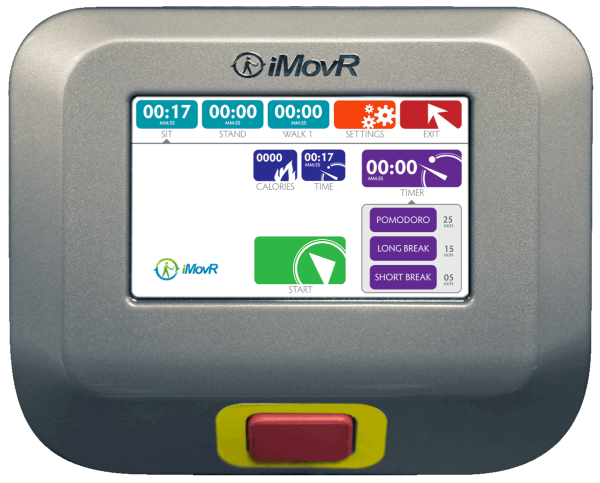 With it, we can measure distance, speed and step count of the user, and upload it to the iMovR cloud with extreme precision, and without skipping a beat. While all popular fitness sensors (e.g. FitBit and Nike FuelBand) significantly underreport treadmill desk usage, and other treadmills have flaky Bluetooth connections to laptop software, not a single step will go uncounted or incorrectly measured when using the iMovR CloudStation. Best of all, this session data syncs automatically, without requiring the user to either remember or risk losing it forever. 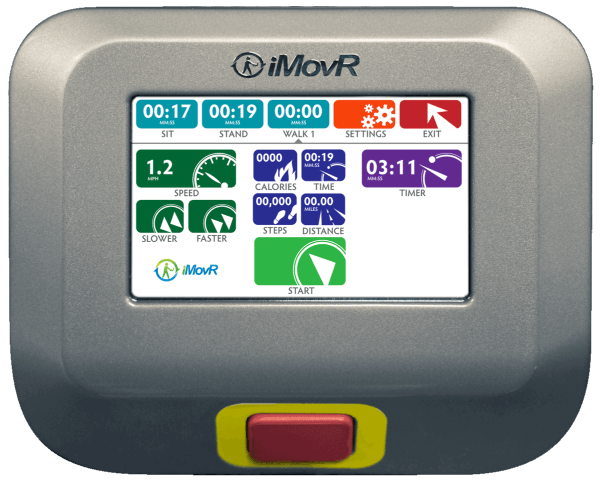 Once this data is in the cloud it can be shared with corporate wellness software platforms, personal fitness sensor software, and a variety of applications that iMovR is developing for enterprise customers, such as ROI analysis and resource utilization reports. Furthermore, using the CloudStation will extend the life of your equipment and reduce your power bills, by measuring friction levels in the treadmill and notifying you when it’s time to lubricate. No more guesswork. View all of our options for treadmill desks. Walking Belt Area 20" x 50"
User Weight Rating 400 lbs. Overall Footprint 67.5" x 28.35" x 9.5"
Boxed Dimensions 72.6" x 33" x 12.4"
Voltage 120V / 60hz / 15 Amp circuit. Pulls max of 7 amp in extreme weight 300 to 400 lbs and max speed. More typical current draw at walking speed with average weight person is in the 1amp to 2.5amp. Current draw increases if treadmill belt is not lubricated every 40 hours of usage. Controller Type High resolution, touch-screen LCD. Has a USB port for easy download of future software upgrades. Internet Connectivity Using iMovR CloudStation, 100% real-time connectivity to the iMovR Cloud. Uploads user and machine performance, downloads user preferences (for treadmill and desk settings), and other advanced software features. Console Dimensions 7.25"x 4.125" x 6"
We offer an excellent warranty on the ThermoTread GT, reflecting our confidence in the office treadmill's manufacturing quality. We have a 100-day, 100% Satisfaction Guarantee. If you receive your ThermoTread GT product and decide it is not what you are looking for, or would like to exchange it, please send it back and we will give you a full refund minus a 20% restocking fee. Customer is responsible for shipping and handling costs of the return. The product must be in its original packaging, and in sellable condition. Simply email us at customercare@imovr.com or call (888) 208-6770 for a return merchandise authorization number. Please note that shipping and handling costs are nonrefundable. If you receive your ThermoTread GT product and decide you would like to exchange it, please contact us for an exchange merchandise authorization number. The product must be in its original packaging, and in sellable condition. Upon receipt of the exchanged item(s), we will promptly send the replacement. Please note that shipping and handling costs for original item(s) are nonrefundable. Buyer pays for shipping and handling costs of replacement item(s). The iMovR ThermoTread GT ships free anywhere in the contiguous United States. Due to its size and weight, it ships via freight carrier on a pallet.